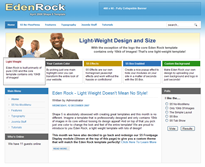 It's actually called Eden Rock, but did you see what I did? It's the new them from that guys over at Shape 5 and it comes paced with options, modules and all the nice things we've come to expect. First on the list of things is the size; it comes with only 10kB of images in the core theme so even if you're in the garden surfing on your Nokia, the site will load quickly. The theme also comes with the S5 Box with dynamic titles, S5 No-MooMenu, S5 Tab Show, custom page and column widths, 16 module positions, custom background images that you can upload and quite a bit more. Create your own color theme by picking just 1 color!